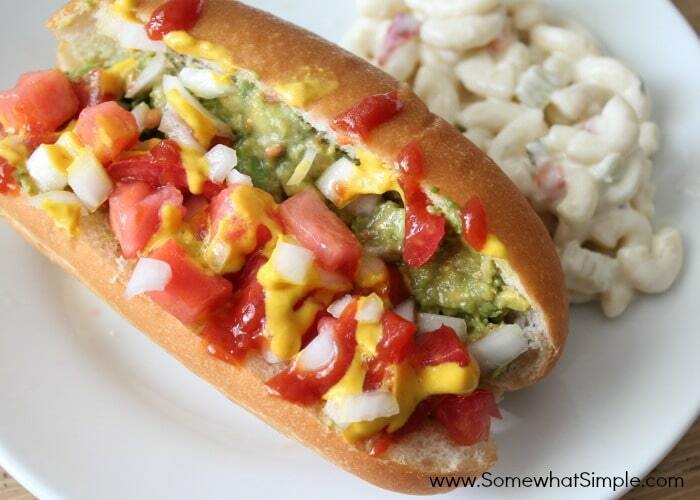 One of my husband’s favorite meals when he lived in Chile were Chilean-style hot dogs called completos. Filled with several delicious toppings, you’ll never eat a hot dog the same way again. 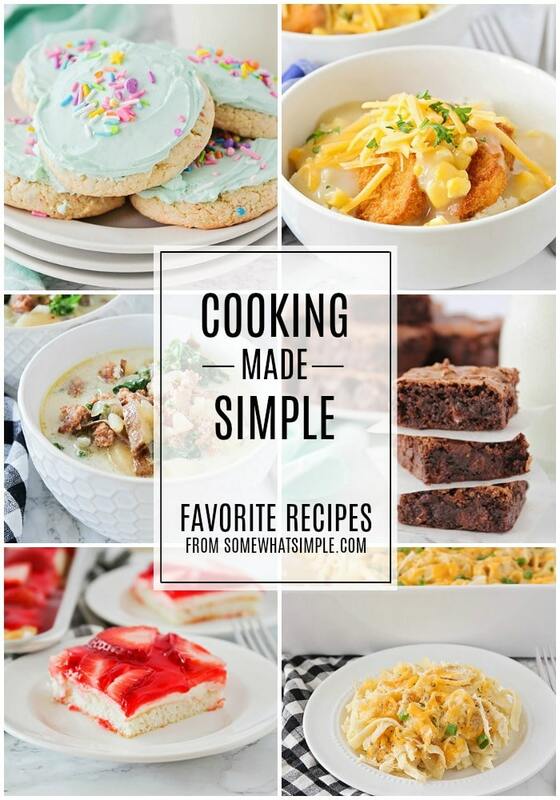 We have Completos quiet often in our home because my whole family loves them and they are super easy to prepare! There is hardly something more kid-friendly than a hot dog, and not only do they love to eat them, they can help you prepare them too! The Chilean’s use big, fresh buns for their hot dogs, so I always make a quick run to the bakery section to find the buns for this meal. Big buns hold the toppings better, but you can use whichever you prefer. 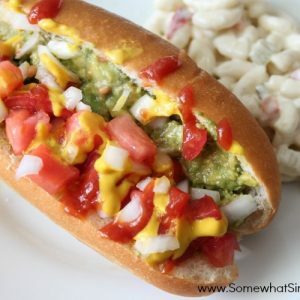 This meal is very customizable and my kids love to build their own creation and make sure there is everything they love and nothing they hate on their hot dog bun. Ethan has everything on his, except the hot dog (weirdo! ), Leah loves it all & Ryan only wants mustard. I add the avocado first and then top it with everything except onions, but my husband tops the diced veggies first then “seals it” with the avocado so they don’t fall out. Lot’s of options, so everyone is happy! 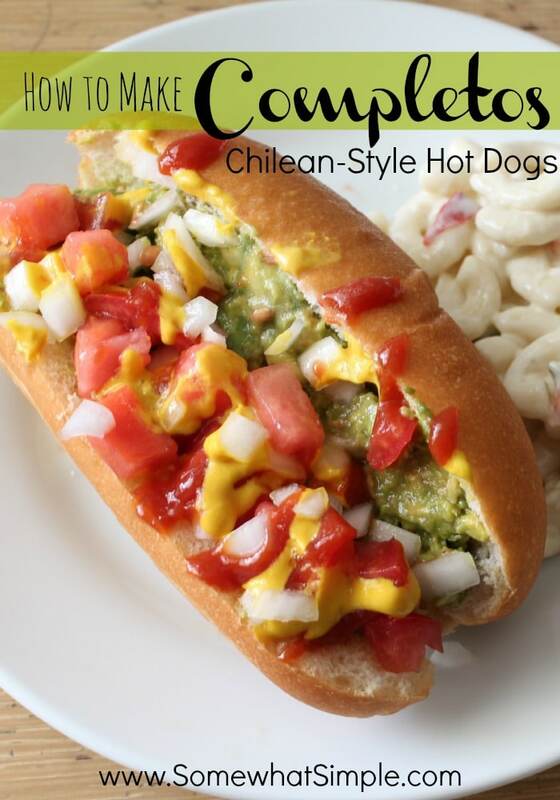 One of my husband's favorite meals when he lived in Chile were Chilean-style hot dogs called completos. 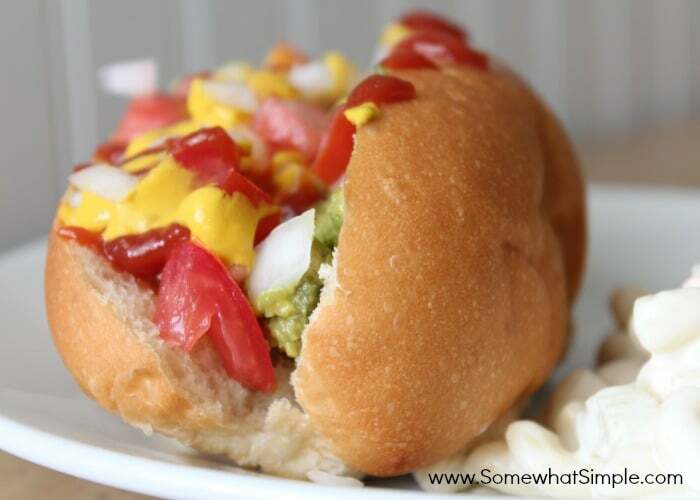 Filled with several delicious toppings, you'll never eat a hot dog the same way again. What Side Dishes Go With Chilean-Style Hot Dogs? *This post originally published on Somewhat Simple in November 2011 and was updated in August 2013. My former sister in law is Chilean and we used to make these for family gatherings (easily customizable and quick). She always had sauerkraut on hand, too. I liked them with everything on them. All those yummy flavors mingling together encased in homemade rolls is totally comfort food. Yum! You’re right! The combination of these flavors is AMAZING! I rarely eat a hot dog now a days without avocado! I served just south of Santiago and we LOVE completos in our house! I do the “sealing” method with avocado, too. My husband served in Santiago as well, and he’s mentioned these several times. My oldest son is heading there in a couple of weeks. I’ll have to make these so he can get a taste of Chile before he gets there. Thanks for sharing Stephanie! I saw that announcement on FB when he got his call- so exciting! It was a great mission. The 2 of us went down there several years ago and the people were so kind! Best of luck to your son (and you as well!) and yes, get him accustomed to the glorious Completo- they sell them on carts all over the streets! One of my old co-workers served in Santiago as well and he introduced us all to the wonder that is the completo! I quit some time ago to be a SAHM but the other day something made me think of these beauties and I had to do a web search for them because I couldn’t quite remember what went on them – so glad I found your post! I didn’t know Completos were a real thing. I thought it was a made up word on the Kid History U tube videos. Now my kids are going to be asking to have them for dinner all the time!